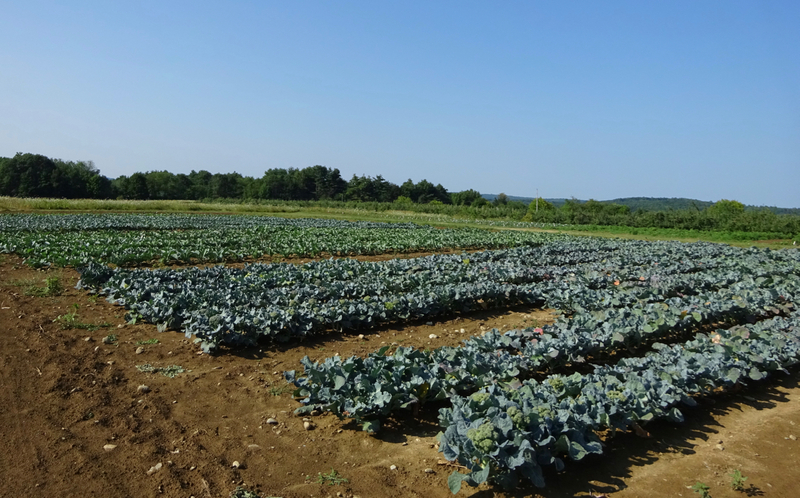 Mark Hutton, of the University of Maine and University of Maine Cooperative Extension, conducts both Quality and Yield trials in this state, the northernmost parts of which include some of the largest broccoli production acreage in the eastern US. Limited, smaller scale production occurs in the central and southern parts of the state. Direct-seeding of the crop is a common practice; soils range from silty to sandy to gravelly loam. Cold temperatures and snow cover persist until relatively late in the spring, making it difficult for Maine producers to plant before June. Summers, especially in the North, are relatively cool but do experience warm spells that can impact crown quality. While rainfall averages appear good for crop production, daily amounts vary considerably, with both drought and excessive rains potentially impacting yields, even within a single growing season. Quality trials are conducted at University of Maine’s Highmoor Farm in Monmouth. Trials are transplanted in double rows onto bare ground in early to mid-June, late June/early July, and mid- to late July for evaluations that run from August through early October. In 2017, Yield trials were conducted at two locations: on grower land in the central part of the state, and at the Aroostook Farm Experiment station in northern Maine. Both were planted in double rows onto bare raised beds; the former was direct-seeded in late June and the latter was transplanted in mid-July. Maine Quality Trial, summer 2017. Planting 1 is in the foreground.